In the decades between 1720 and 1760, long regarded by musicologists as having been dominated by J S Bach, it was—if we return to the information from the time—not Bach but Telemann who held the predominant position in German musical history. Much of this influence was due to his own ability to promote himself and all his considerable musical activity, whether in his official function as Kantor (in a number of musical centres), as a promoter and organizer of concerts, a publisher of music, a theorist, or simply as an enormously prolific composer of a wide variety of music, ranging from sacred cantatas to operas, concertos to secular songs. Telemann’s sound commercial instincts which brought him such wealth and success are not altogether surprising. He was born into a well-educated, upper-middle-class family, and was intended to become a lawyer. Indeed, when he began showing considerable promise (not least of all by embarking, at the age of only twelve, on the composition of an opera, Sigismundus), he was forbidden to have any further involvement with music. Sent away to school, it was assumed that he would follow a straighter path to his real vocation, but even here his musical studies continued. At university in Leipzig, still intending to study law, one of his compositions led to his being commissioned by the mayor to write a cantata every fortnight, and, much to his mother’s irritation, Telemann’s musical career was set. In 1702, while still at university, Telemann founded a collegium musicum, intended as an organization to promote public performances of works, often composed for some special occasion, which would not otherwise be heard by the majority of the public. From his first appointment (as organist of the university church), he set about breaking down the strict barriers that existed between composers of sacred and secular music, and also—with music publishing in its infancy in Germany—set about publishing as much as possible. In doing so, he was, as well as amassing a sizeable fortune, providing a service to his fellow musicians, who had up until then experienced some difficulty in obtaining printed music. The period of twenty years from 1720 saw a considerable growth in the spread of amateur music-making and Telemann accelerated this process by publishing a great quantity of instrumental music which, though technically not always too demanding, offered scope for spirited and lively playing. The three volumes published in 1733 with the title Musique de Table certainly fit that latter description. The complete Musique de Table consists of three ‘Productions’, each one containing a Suite with a Conclusion, together with an independent Concerto, Quartet, Trio and solo Sonata. There is much variety in the combinations of instruments required: the third Production for instance offers the Suite in B flat major for two oboes and strings, recorded here, together with a Quartet in E minor for violin, flute, cello and continuo, a Concerto in E flat major for two trombe selvatiche (hunting horns) and strings, a Trio in D major for two flutes and continuo, and finally the Conclusion. Although Telemann chose a French title for the three volumes, the music also contains elements of Italian, German and Polish styles as well. Its popularity among the musical cognoscenti can be seen from the original subscription lists, which show among the 185 names those of Quantz, Pisendel, Blavet and Handel, who borrowed extensively from the works. The title of the collection and the form in which the works were printed suggest that Telemann intended the volumes to be dipped into, rather than performed continuously. 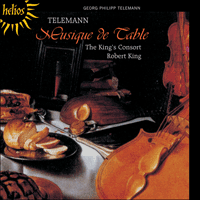 Tafelmusik was the German title given to the ancient custom of entertaining guests at meals with background music, and it is into this category of the highest quality ‘wallpaper’ that such exuberant, spirited music—full of witty touches and good tunes—certainly falls. The Suite in D major in the Deuxième Production begins with a lengthy Ouverture, alternating a slow dotted section with a quicker, imitative idea, with rhythmic interest added by the simultaneous combination of triplets and duplets in the tutti sections that separate the varied episodes. Four movements, each titled Air, follow this large-scale opening. The general-purpose movement title could hardly cover a wider range of music: Air 1 contains, besides its lively subject (which Handel took as the basis for his organ concerto Op 7 No 4), some remarkable accompanying figurations for the violins which would have tested the best amateur players. Air 2 is in the style of a stately minuet, alternating the pairing of trumpet and oboe with the two violins between repetitions of the main theme. Air 3 is a lively Presto, again full of witty touches in the accompaniment and containing a series of delightful violin links back to the tuttis, along with a contrasting minor middle section. Air 4 in 12/8 time has, for contrast, a concertino group of string quartet, without double bass or harpsichord, and, just before the da capo, a lyrical cadenza for the solo violin. The Conclusion finds Telemann at his best, with a sparkling opening theme, and episodes where the two violins and the pair of wind instruments engage in rapid dialogue. The short Adagio is a total contrast, with a fine example of the composer’s familiar staccato accompaniment, over which the oboe and trumpet thread a long, continuous melody before the lively opening returns. The Suite in B flat major for two oboes and strings from the Troisième Production is on paper a rather more conventional suite, with an Ouverture, a selection of dances (all given the French versions of their titles), and, once again, a Conclusion. With two pairs of relatively equal instruments, oboes and violins, Telemann explores the possibilities inherent in the concertato style. The Ouverture is the longest movement, written in the conventional slow–fast–slow pattern, and given its full repeat structure in this performance; Handel used the fugal theme of the fast section in his Occasional Oratorio (1746). The first dance, an elegant Bergerie, uses the oboes in their familiar pastoral mode; in the next movement, an energetic Allegresse (marked ‘vite’), Telemann again writes in ternary form, with a contrasting middle section in the minor. Postillons, which Handel borrowed for use in Belshazzar, is characterized throughout by a rhythmic, syncopated octave leap which appears in all the parts, and has a ‘throw away’ ending. French graces are at their most elegant in the Flaterie; the following Badinage, literally a ‘trifle’ or ‘piece of fun’, is similar to a gavotte, but with the addition of a trio in which the cello has a series of rapidly repeated bass notes. The more conventionally named Menuet that follows also has a contrasting trio section, and its theme provided Max Reger two centuries later with the basis for his set of variations for piano (Op 134). Finally comes the busy Conclusion, marked ‘furioso’: rising arpeggios in the upper strings over a drone bass alternate with an energetic motif which is treated imitatively. The two ideas alternate until, as a final flippant gesture to such bubbling music, the suite has another lighthearted throw away ending. Contrairement à ce que les musicologues ont longtemps considéré, les années 1720 à 1760 furent dominées non par J. S. Bach mais—si l’on se replonge dans les sources de l’époque—par Telemann, qui eut la haute main sur l’histoire musicale allemande. Il faut dire qu’il sut se promouvoir et eut une prodigieuse activité musicale, que ce fût dans sa fonction officielle de Kantor (dans plusieurs centres musicaux) ou dans tous ses autres rôles: promoteur et organisateur de concerts, éditeur de musique, théoricien ou, simplement, compositeur formidablement prolifique de pièces allant des cantates sacrées aux opéras, des concertos aux chants profanes. Cette richesse et cette réussite, Telemann les dut à un sens des affaires tout sauf surprenant: issu d’une famille cultivée de la haute bourgeoisie, il était voué à une carrière d’homme de loi. Et de fait, lorsqu’il commença de se montrer fort prometteur en musique (en se lançant, notamment, dans la composition d’un opéra, Sigismundus, à l’âge de seulement douze ans), on lui interdit de s’investir davantage dans cette voie et on l’envoya à l’école, où il était censé se recentrer sur sa vraie tâche. Mais, même là, ses études musicales se poursuivirent. À l’Université de Leipzig, où il se destinait encore au droit, il composa une œuvre qui lui valut une commande du maire (une cantate tous les quinze jours): au grand dam de sa mère, sa carrière musicale était lancée. En 1702, alors qu’il était toujours à l’université, Telemann fonda un collegium musicum, une structure destinée à promouvoir les exécutions publiques d’œuvres généralement inaccessibles au grand public, car souvent composées pour des événements particuliers. Dès sa première nomination (à l’église de l’université, comme organiste), il s’attacha à faire tomber les barrières dressées entre les compositeurs de musique sacrée et ceux de musique profane; profitant des balbutiements de l’édition musicale allemande, il publia autant qu’il put et amassa une fortune considérable. Mais sa démarche aida aussi ses collègues musiciens, qui avaient jusqu’alors du mal à se procurer des musiques imprimées. Les années 1720–1740 virent un immense développement de la pratique musicale en amateur, un processus que Telemann précipita en publiant de très nombreuses pièces instrumentales qui, même si elles n’étaient pas d’une grande exigence technique, permettaient un jeu gai, enlevé—des épithètes qui conviennent bien au trois volumes de Musique de Table parus en 1733. Cette Musique de Table comprend, au total, trois «Productions» avec chacune une Suite dotée d’une Conclusion, un Concerto indépendant, un Quatuor, un Trio et une Sonate de soliste. Les combinaisons instrumentales requises sont très variées: outre la Sonate en si bémol majeur pour deux hautbois et cordes enregistrée ici, la Troisième Production propose ainsi un Quatuor en mi mineur pour violon, flûte, violoncelle et continuo, un Concerto en mi bémol majeur pour deux trombe selvatiche (cors de chasse) et cordes, un Trio en ré majeur pour deux flûtes et continuo et, enfin, la Conclusion. Malgré leur titre français, ces trois volumes renferment aussi des éléments stylistiques italiens, allemands et polonais. Les listes de souscription originales montrent combien cette musique était populaire auprès des connaisseurs: parmi les cent quatre-vingt-cinq noms relevés figurent ceux de Quantz, de Pisendel, de Blavet et de Haendel (qui puisa largement dans ces œuvres). Le titre de la collection et la forme sous laquelle ces pièces furent imprimées suggèrent que Telemann souhaitait que l’on piochât dans ses volumes, non qu’on les jouât à la file. L’appellation allemande Tafelmusik désignait la coutume ancienne consistant à divertir les invités attablés avec une musique de fond, et c’est bien à ce «papier peint» de la plus belle facture que ressortissent des pages aussi exubérantes, aussi enjouées, pleines de touches facétieuses et de beaux airs. La Suite en ré majeur de la Deuxième Production commence par une fort longue Ouverture, où alternent une section pointée lente et une idée imitative plus rapide, avec un argument rythmique augmenté par la combinaison simultanée de triolets et de duolets dans les sections de tutti séparant les épisodes variés. Cette ouverture à grande échelle est suivie de quatre mouvements, tous baptisés Air, un titre polyvalent qui saurait difficilement couvrir un plus large éventail musical: hormis son sujet animé (dont Haendel fit la base de son Concerto pour orgue, op. 7 no4), l’Air 1 affiche de remarquables figurations accompagnantes pour les violons, qui devaient éprouver les meilleurs interprètes dilettantes. L’Air 2, dans le style d’un menuet majestueux, voit l’appariement trompette / hautbois alterner avec les deux violons entre les reprises du thème principal. L’Air 3, un enjoué Presto à l’accompagnement également des plus facétieux, recèle une série de délicieux liens violonistiques ramenant aux tuttis, mais aussi une section centrale en mineur, qui fait un coq-à-l’âne. Par contraste, l’Air 4 à 12/8 présente une concertino de quatuor à cordes, sans contrebasse ni clavecin, et, juste avant le da capo, une cadenza lyrique pour le violon solo. La Conclusion nous montre un Telemann à son meilleur, avec un étincelant thème d’ouverture et des épisodes où les deux violons et la paire d’instruments à vent se livrent à un dialogue rapide. Le court Adagio est aux antipodes, avec un bel exemple de l’accompagnement staccato cher au compositeur, par-dessus lequel hautbois et trompette filent une longue mélodie continue avant le retour de l’ouverture enjouée. La Suite en si bémol majeur pour deux hautbois et cordes extraite de la Troisième Production est plus conventionnelle, sur le papier du moins, avec une Ouverture, un choix de danses (aux titres tous français) et, de nouveau, une Conclusion. Avec deux paires d’instruments relativement égaux (hautbois et violons), Telemann explore les possibilités inhérentes au stile concertato. L’Ouverture, le mouvement le plus long, adopte le schéma traditionnel lent–rapide–lent; la présente exécution respecte l’intégralité de sa structure avec reprises. Haendel utilisa le thème fugué de la section rapide dans son Occasional Oratorio (1746). La première danse, une élégante Bergerie, emploie les hautbois dans leur habituel mode pastoral; dans le mouvement suivant, une énergique Allegresse (marquée «vite»), Telemann revient à une forme ternaire avec une section centrale constrastée, en mineur. Caractérisé par un saut d’octave rythmique, syncopé, qui apparaît à toutes les parties, Postillons (dont Haendel se servit dans Belshazzar) a une fin qui n’a «l’air de rien». Les agréments français sont élégants au possible dans la Flaterie; le Badinage suivant s’apparente à une gavotte, mais avec un trio supplémentaire, dans lequel le violoncelle se voit confier une série de notes graves répétées rapidement. Vient alors le Menuet—un titre plus conventionnel—qui a, lui aussi, une section en trio contrastée; deux siècles plus tard, son thème servira de base aux variations pour piano de Max Reger (op. 134). Enfin, la Conclusion affairée, marquée «furioso»: des arpèges ascendants aux cordes supérieures par-dessus une pédale alternent avec un énergique motif traité en imitation. Cette alternance se poursuit jusqu’à ce que, dans un geste final désinvolte pour une musique aussi bouillonnante, la suite se conclue une fois encore dans la légèreté, l’air de rien. In den Jahrzehnten von 1720 bis 1760, die Musikwissenschaftlern lange als von J. S. Bach dominiert betrachteten, war es nicht Bach sondern Telemann, der die bedeutendste Position in der deutschen Musikgeschichte inne hatte. Dieser Einfluss war zu einem Großteil durch sein Talent zur Eigenpromotion und seine erheblichen musikalischen Aktivitäten veranlasst, sei es in seiner offiziellen Funktion als Kantor (in einer Anzahl von Musikzentren), als Konzertveranstalter, Musikverleger, Theoretiker oder schlicht als Komponist eines enormen musikalischen Œeuvres mit breiter Vielfalt—von geistlichen Kantaten bis zu Opern und von Konzerten bis zu weltlichen Liedern. Telemanns solider Geschäftssinn, der ihm solchen Wohlstand und Erfolg einbrachte, ist keine große Überraschung. Er wurde in eine gebildete Familie aus dem oberen Mittelstand geboren und sollte eigentlich Jurist werden. Als sich seine beträchtliche musikalische Begabung herausstellte (nicht zuletzt, als er im Alter von zwölf Jahren mit der Komposition einer Oper Sigismundus begann), wurde ihm sogar jede weitere Beschäftigung mit Musik verboten. Er wurde ins Internat geschickt, wo er angeblich einem geraderen Weg zu seinem wahren Beruf folgen sollte, aber selbst hier ging sein Musikstudium weiter. An der Leipziger Universität, wo er immer noch Jura studieren wollte, veranlasste eine seiner Kompositionen den Bürgermeister dazu, bei ihm eine Kantate für jede zweite Woche zu bestellen, und zum Verdruss seiner Mutter begann damit seine musikalische Karriere. 1702, als er noch an der Universität studierte, gründete Telemann ein Collegium musicum, das öffentliche Aufführungen von oft für besondere Gelegenheiten komponierten Werken veranstalten sollte, die das weitere Publikum sonst nicht hätte hören können. Von seiner ersten Anstellung (als Organist der Universitätskirche) an, bemühte er sich, die strengen Grenzen, die zwischen Komponisten geistlicher und weltlicher Musik bestanden, zu lockern, und während das Musikverlagswesen in Deutschland noch in den Kinderschuhen steckte, bemühte er sich auch, so viel wie möglich zu veröffentlichen. Damit sammelte er nicht nur ein großes Vermögen an, sondern bot auch einen Dienst für seine Musikerkollegen, die bis dahin Schwierigkeiten hatten, gedruckte Musik zu erhalten. Die Periode der zwanzig Jahre ab 1720 sah einen beachtlichen Anwachs in der Musikzierfreude von Laien, und Telemann beschleunigte den Prozess, indem er eine große Anzahl von Instrumentalmusik veröffentlichte, die, obwohl technisch nicht immer allzu anspruchsvoll, Gelegenheit zu lebhaftem und begeistertem Spiel bot. Die drei Bände, die er 1733 unter dem Titel Musique de Table veröffentliche, gehören in diese Kategorie. Die vollständige Musique de Table besteht aus drei „Productions“ (frei übersetzt: „Lieferungen“), die jeweils eine Suite mit einer Conclusion (ein Satz zum „Abschluss“) sowie jeweils ein eigenständiges Konzert, Quartett, Trio und eine Solosonate enthalten. In der Kombination der Instrumente wird große Vielfalt verlangt: die dritte „Production“ zum Beispiel bietet die hier eingespielte Suite in B-Dur für zwei Oboen und Streicher, zusammen mit einem Quartett in e-Moll für Violine, Flöte, Cello und Continuo, ein Konzert in Es-Dur für zwei „Trombe selvatiche“ (Waldhörner) und Streicher, ein Trio in D-Dur für zwei Flöten und Continuo und die Conclusion. Obwohl Telemann für die drei Bände einen französischen Titel wählte, enthält die Musik auch Elemente des italienischen, deutschen und polnischen Stils. Ihre Popularität unter Musikkennern lässt sich aus den Originalsubskriptionslisten ersehen, unter deren 185 Namen sich Quantz, Pisendel, Blavet und Händel finden, der ausgiebig aus diesen Werken borgte. Der Titel der Sammlung, und die Form, in der die Werke gedruckt wurden, deutet an, dass Telemanns Absicht weniger war, dass sie durchgängig aufgeführt werden sollten, sondern eher erwartete, dass man hier und da in die Bände hinein „stippte“. Der deutsche Ausdruck Tafelmusik bezog sich auf den alten Brauch, Gäste beim Mahle mit Musik im Hintergrund zu unterhalten, und seine überschwängliche, lebhafte, humorvolle und melodiöse Musik fällt bestimmt in diese Kategorie von „Tapetenmusik“ der höchsten Qualität. Die Suite in D-Dur in der Deuxième Production beginnt mit einer langen Ouverture, in der sich ein langsam-punktierter Abschnitt mit einer schnelleren imitativen Idee abwechselt, wobei die Tutti-Abschnitte, die die verschiedenen Episoden unterteilen, durch die Kombination gleichzeitiger Triolen und Duolen rhythmisch interessant gestaltet werden. Diesem stattlichen Beginn folgen vier Sätze, die alle mit Air überschrieben sind. Dieser Allzwecktitel könnte kaum eine größere musikalische Bandbreite umfassen: Air 1 enthält einige bemerkenswerte Begleitfiguren für die Violinen, die selbst die besten Laienmusiker auf die Probe gestellt hätten; Air 2 ist im Stil eines erhabenen Menuetts, in dem sich zwischen Wiederholungen des Hauptthemas Paare von Trompeten und Oboen jeweils mit zwei Violinen abwechseln; Air 3 ist ein lebhaftes Presto, das in der Begleitung wiederum voll humoriger Momente steckt und eine Reihe anmutiger Überleitungen der Geigen zurück in die Tutti sowie einen kontrastierenden Mittelteil enthält; Air 4 im 12/8-Takt besitzt im Gegensatz dazu ein Streichquartett ohne Bass oder Cembalo als Concertino-Gruppe, und kurz vor dem Da capo folgt eine lyrische Kadenz für die erste Violine. Die Conclusion findet Telemann in bester Form mit einem sprühenden Anfangsthema und Episoden, in denen die beiden Violinen und das Bläserpaar sich in schnellem Dialog austauschen. Das kurze Adagio steht in totalem Kontrast dazu und bietet ein herrliches Beispiel für die wohl bekannte Stakkato-Begleitung des Komponisten, über der Oboe und Trompete eine lange, ununterbrochene Melodie spinnen, bis die lebhafte Anfangsmusik wiederkehrt. Die Suite in B-Dur für zwei Oboen und Streicher aus der Troisième Production ist auf den ersten Blick eine konventionellere Affäre mit einer Ouverture, einer Folge von Tänzen (jeweils mit ihrem französischen Namen) und wiederum einer Conclusion. Mit zwei Paaren relativ ausgeglichener Instrumente—Oboen und Violinen—kundet Telemann die Möglichkeiten aus, die der Concertato-Stil bietet. Die Ouverture ist der längste Satz und folgt dem konventionellen Muster langsam–schnell–langsam und wird hier in in seiner vollen Länge mit allen Wiederholungen aufgeführt; Händel verwendete das Fugenthema des schnellen Teils in seinem Occasional Oratorio (1746). Der erste Tanz ist eine elegante Bergerie und verwendet die Oboen in vertrauter pastoraler Stimmung; im nächsten Satz, einer energischen Allegresse (mit der Markierung „vite“) schreibt Telemann wiederum in dreiteiliger Form mit einem kontrastierenden Mittelteil. Postillon—von Händel für Belshazzar geborgt—wird durchweg vom rhythmischen Motiv eines synkopierten Oktavsprungs charakterisiert, der in allen Stimmen erscheint, und hat einen „hingeworfenen“ Schluss. Französische Verzierungen treten in der eleganten Flaterie besonders wirkungsvoll hervor, und die folgende Badinage (buchstäblich eine „Neckerei“ oder ein „Scherz“) ähnelt einer Gavotte, aber mit dem Zusatz eines Trios, in dem das Cello eine Reihe schnell repetierter Bassnoten enthält. Das konventioneller benannte Menuet, das folgt, hat ebenfalls einen kontrastierenden Trioabschnitt, dessen Thema Reger zwei Jahrhunderte später die Grundlage für seine Klaviervariationen op. 134 lieferte. Zum Abschluss folgt die geschäftige Conclusion mit der Überschrift „furioso“: aufsteigende Arpeggien in den hohen Streichern über einem Bordun-Bass wechseln sich mit einem energischen Motiv ab, das imitativ verarbeitet wird. Die beiden Ideen alternieren bis die Suite mit einer letzten saloppen Geste diese überschäumende Musik wieder mit einem leichtfertig dahingeworfenen Ende abschließt.